Many books have been written about dog nutrition. Every breeder has his own food schedule and every producer has its own line of food and different product. Moreover, every pet store can exactly tell you what to buy to keep your dog as healthy as possible. In short, for most brand new owners of a Dalmatian puppy it might be somewhat difficult to see the wood for the trees. Our advice is to initially stick to our guidelines and the food the puppy is used to eating with us. The puppy is used to this food and a rapid switch to other food can only cause diarrhoea. As soon as your puppy is accustomed to your house you can, if you want, slowly make the change to other high quality dog food. Good brands are for instant Hill’s and Eukanuba. Royal Canin is also very good food. 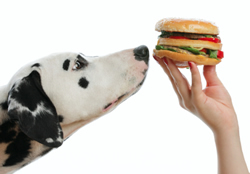 Give your Dalmatian high quality food, at least for the duration of their entire growth period. Don’t base it off of the good intentions of the pet store too quickly. Their advice often includes a commercial aspect. When you come over to pick up your puppy, you will receive an extended puppy package, which includes a bag of food for the first couple of days and a kennel folder with the feeding schedule. A good puppy feeding schedule consists of at least four meals a day. The puppy still has a very small stomach and can process four small meals better than one big meal. Your Dalmatian puppy will receive dry food from us that is made for puppies. This contains all the ingredients the puppy needs to have a proper and balanced growth. You can give the puppy puppydinner, canned food or fresh meat for a change. Always feed with your eyes. If the puppy is too skinny (you can see the ribs), give him some more food than the indicated amount. If the puppy too fat (he starts to look like a coffee table), then give him a bit less. Don’t give the puppy too many special treats. It has to remain special. But a reward cookie during the puppy class obviously won’t do any harm. A male or a female ?